As I look through all the photos of our trip to Fowey, I realize the difficulty of condensing all of our photographic memories in order to distill a time and place. I think, because I don't want to just throw up a few pictures and call it just a visit, that it's hard to actually capture this memory and place, and our time within. This place is special, this place pulled at our heartstrings, this place calls to old souls, our old souls. Is it possibly because we decided to re-read Rebecca, written here in this very place by Daphne du Maurier? Is it maybe because we were within arm's reach of where she wrote this other-worldly novel, maybe because it all seemed so close and maybe because so little has changed? I don't know why. I know it was unique and special, and I know I'll never forget the walk up the dark lane, when the owls were calling back and forth across the river and Jonathan just wanted to turn around, but I made us keep going uphill, up the black path and we giggled and stumbled and were glad to be together, holding hands, like we do, yet again. You must read Rebecca, you really should. I first read it years ago and loved it then. I loved it again this time and Jonathan couldn't put it down. It's a remarkable piece of fiction, a novel of a time and place that's both mysterious and yet easy to fall into; it pulls you deeply into a world that's both foreign and yet strangely familiar. As we read the novel, both with Kindles in hand, we were sat outside looking out over the home where she wrote this tale and looking out over the beautiful River Fowey running out to the English Channel. The house just below with the blue shutters is where Daphne du Maurier wrote the book, Rebecca. The place where we stayed, the Old Ferry Inn, is actually in Bodinnick, just across the river from Fowey. It's an old Cornish inn that has been there for over 400 years. It's a wonderful old property, run by a rather eccentric Frenchman who makes the most amazing food. We had a wonderful time there, staying in a room at the top of the inn with windows looking out over the river. There's a ferry that runs every 15 minutes or so, hustling people and cars back and forth across the two minute ride between Bodinnick and Fowey. 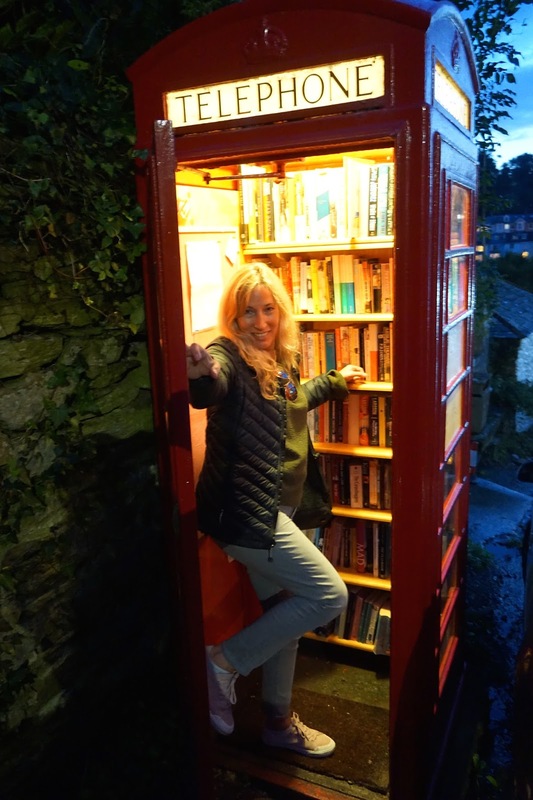 Bodinnick is very tiny, there's not a lot there except for the Old Ferry Inn and just across the lane, a very cool little library contained within an old, red British phone booth. Oh, how my librarian heart swooned! So we read, drank wonderful ales, and ate delicious food in the sun made by the rather interesting Frenchman. And of course we explored the area. We took the cute little ferry across the river, about two pounds each to cross, and wandered about the beautiful old town of Fowey in South Cornwall. Fowey has been in existence since about 1300 and so you can imagine the history and buildings were fantastic to explore. It's a lovely place situated on the River Fowey, an estuary leading out to the English Channel in Southern Cornwall. The mouth of the river leading into the English Channel in South Cornwall. The cobbled tiny streets of Fowey were filled with interesting buildings, lovely little shops, inviting pubs, and sweet homes, many with quirky and fun names. I want to live in a place called Baggywrinkle, I don't know why! And to wrap it all up, at least for now, I leave you with the notion that England is a funny place, where history and zaniness come together in an interestingly jumbled up sort of way that's hard to find anywhere else in this world. I love this place, England.